＞Welcome to Goodsmile Online Shop !! 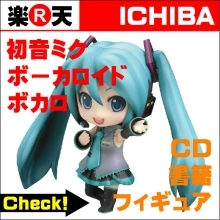 Nendoroid Miku Hatsune: Support ver. This is a charity product. For each purchase made, a \1000 donation will be made to the Japan Red Cross in order to support relief efforts in Eastern Japan. The famous Miku Nendoroid is joining the efforts to restore Eastern Japan, and she is bringing with her a brand new smile, a support flag and pompons so she can really cheer on the people who need it most. Orders will be taken from 2011/04/08 at 12:00(JST) until 2011/04/21 at 23:59(JST). - Products will be made-to-order. - Delivery will be in late July 2011. - Credit card will be the only payment method available for overseas orders. - Your credit card will be charged on order, and not at the time of delivery. - Shipping to any available countries will be charged at 2000JPY. - Additional taxes and fees may apply when the product reaches your country. These fees are not related to us in any way. - Please email shop.overseas@goodsmile.jp if you have any queries. English or Japanese queries only please. c Crypton Future Media, Inc.
＞New Vocaloid VY2 Sample Song "Asadoya Yunta"